I have put away all the Christmas decorations and now the house feels cold and bare. Does that ever happen to you? 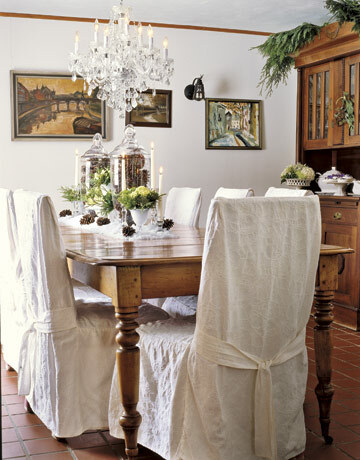 January can be a little daunting when it comes to decorating our homes. But now we can embrace winter decor without all the holiday themes. On the mantel, I leave some of the greens and then add flowering bulbs that I planted in December. This time of year I plant bulbs like hyacinths and more narcissus every two weeks to bloom in the dead of winter. It's fun to see their roots form and the smell is wonderful when in bloom. Simple arrangements under glass and lots of pine cones say January to me. This is when you can tap mother nature for lots of decorations, some of which are free! Like branches and twigs, berries and nuts, apples and oranges. I also appreciate the warmth of velvets, chenilles and wool throws this time of year, since January is for cuddling up and staying warm. This is when a velvet upholstered bed layered with wool blankets just seems perfect! Since daylight is short in January, I like having lots of candles around the house to keep things festive and relieve the winter blahs. Candles scented with cinnamon, pine, orange or even gingerbread are also nice. And of course, there's nothing like a fire all aglow while it storms outside! We keep logs on hand made from recycled material such as coffee. They burn clean and are safer for the environment. Remember to use natural elements, like twigs and pine cones, and winter flowering bulbs. Fruits like apples, berries or studded oranges in arrangements. Add a paisley wool throw, a plaid blanket or a quilt to the sofa or bed, and pile on the pillows. Set spicy scented candles everywhere, and light them! Build a fire and cozy up to winter! Is that your bed? Wow, I love it!!! Miss you friend... when can we hang out? Such a cozy post! Just what I needed! Delores, I need to come cozy in at your house, it looks so inviting. You gave us all great advice on how to keep our homes looking warm and inviting in these cold winter months. Love it!!! Wonderful ideas! I like to use a lot of candles as well. I like your idea about the bulbs. My kids would enjoy that too. Lovely winter decorating post. Great and simple idea to plant bulbs often so you always have something blooming. I love a fire in the fireplace and lots of candles too. Your house looks cozy and warm! Wonderful ideas. Your house always looks so warm and welcoming. All great ideas, Delores. I just planted more bulbs in the garden yesterday. Looking forward to a colorful spring. 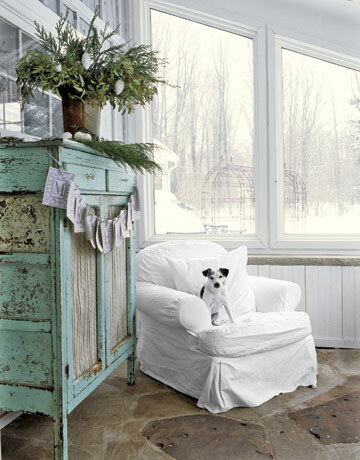 All of your tips make for a warm and inviting home during the cold winter months! Good post! Everything is always beautiful at your place. Thanks for sharing. Indeed a nice month for reading by the fire side and for using a light mohair throw on your lap to stay comfy. Orange scents with spices are very nice to have indoors. Of course the fragrant bulbs is a wonderful trade that came from the home country and has been embraced by most people world wide. Living with fragrant flowers seems unthinkable. Enjoy your winter time and if you want to win a 925/000 silver angel from the heart of Tuscany, see my worldwide giveaway. Love the idea of using natural elements to decorate after the holidays...nothing like blooming plants to start a new year refreshed! The idea of candles/fireplace sounds GREAT to stay warm. Thanks for sharing! Delores, your home is so pretty any time of year! I love these ideas and will try and plant some bulbs before it's too late. I wish we had a fireplace in this house, one thing we'll be sure to include in our addition! Beautiful cozy winter decor...so welcoming! As much as I like them, I'm actually glad to clear out the decorations and Christmas decor at the end of December. My eyes need the simplicity. By Thanksgiving, I'm ready to go again with all the glitter and glam. I forced narcissus bulbs for the holidays, but really didn't think about doing them in succession throughout the winter - great idea! I was so easy, I think I'll see if I can still find some bulbs. Thanks for posting your great ideas on winter decorating, Delores. I have not yet taken down my Christmas decor or tree. I always struggle right after wards because everything looks so lonely and empty. Your house looks cozy and warm. We need to light the fire more often as well as the candles. Your bird candles are gorgeous! What a find those were. I'm a lover of anything with birds. Hope 2011 is off to a great start for you! Sounds wonderfully cozy. Very inspiring ~ love your ideas. Love your ideas! I have my paperwhites blooming right now and my amaryllis. I was late planting them so they bloomed after Christmas, which is fine because I get to enjoy some nature indoors! 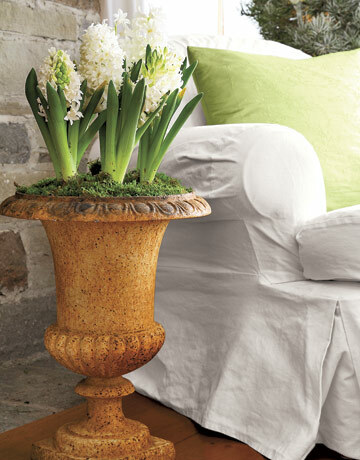 I am about to plant a whole bunch of tulips,dafodils,crocus and more paperwhites in a large pot so I can enjoy more mother nature in doors...we have a lot of snow here! We had such a complicated and tricky Christmas. just the same stuff that has kept me from blogging the last couple of months. Also, there was a funeral that Tom officiated and I played for - the Tuesday before Christmas, of all things. It was hard and exhausting to do but a priviledge to minister to these hurting people. The nice thing was that they gave us one of the gorgeous bouquets - it had the most deep, red, velvet, swaths of petals. I got to break it down and use it for a centrepiece for our Christmas dinner table. Unfortunately, I didn't get my new lens until just a few days ago. The point?! The point is that I was wanting to go and get some more red roses like that but, now, I've been waiting to go and get some gorgeous WHITE roses, instead. It's the same mood that these posts are in. Do you see what i mean, i wonder? Anyway, it is so late. I enjoyed visiting you during Christmas but don't know if I ever got to leave a message. I'm so sorry to be so silent. Life has been a little rough! I'm still here, though, and still loving your posts!